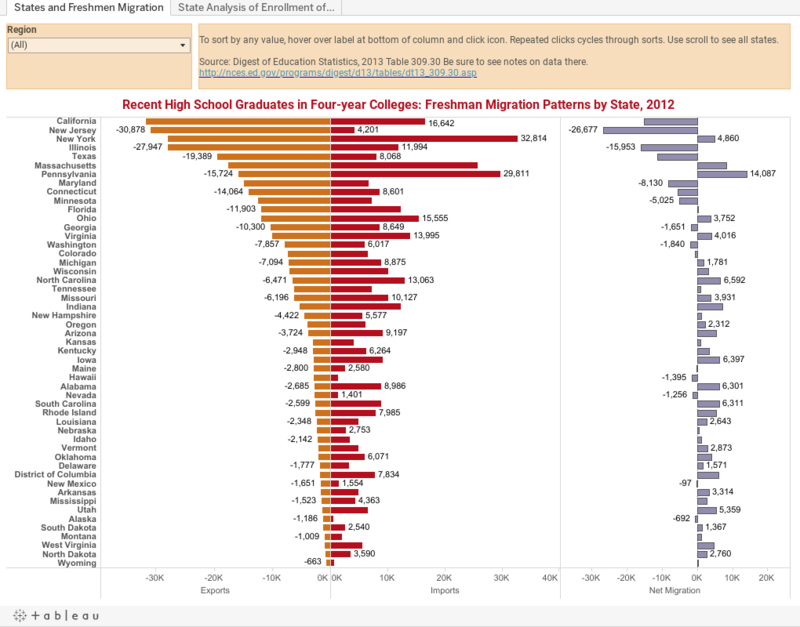 One of the more popular and interesting (IMHO) posts on this blog was the one on freshman migration. It's interesting to see, I think, where colleges and universities draw their freshman from. Normally, I think it's best to start at a high level and drill down, but this time, I'm going in reverse. This is a much higher-level view of the data, by state, and it includes only recent high school graduates who go to a four-year college (you might call them traditional freshmen, even though they're actually in the minority.) But there is still a lot of interesting stuff here, I think. You've seen how to manipulate a Tableau visualization (or if you haven't click here), so use those skills to see how many interesting tidbits you can find in this visualization. Hover over the top or bottom of the column to sort the column, using the little icons there. Here's a factoid to start: The percentage of freshmen who stay in state is the highest in Utah.